My client provided the content with the help of wireframes which I created using Adobe XD. 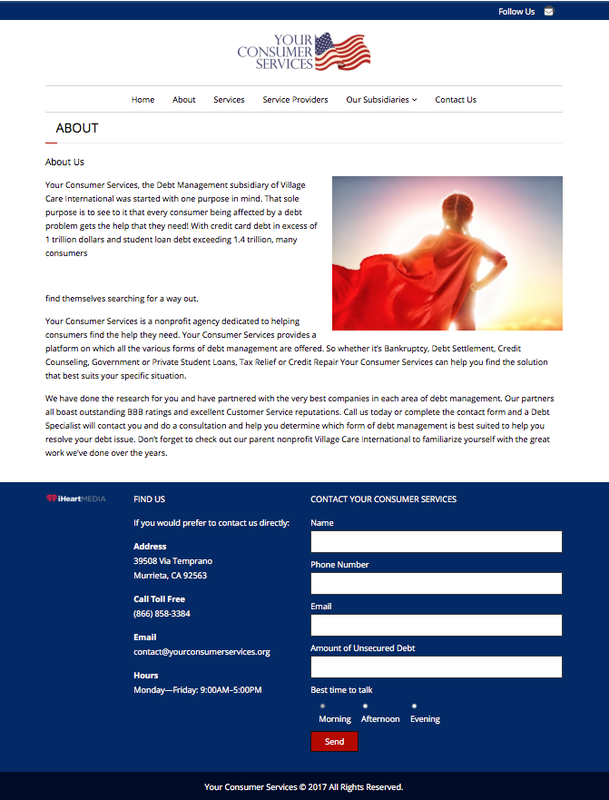 By blocking off sections of content with place-holding text, the client was able to use the wireframes as a visual aid when writing their content. Once the client has shared the content created from the wireframes, we work together to edit the copy and placement so that the content is as pleasing to the ear as it is to the eye. The client came to me to build a website and brand for a non-profit organization. This organization was affiliated with iHeart Radio and needed to reflect the style associated with iHeart Media. The client requested a patriotic theme and had a business card with an American flag that they wanted to match. I created the color scheme, style board, website design and deployed that design using Wordpress and a custom theme. After evaluating the demographics of Your Consumer Services clientele and the goals behind the project, the client and I built a brand. The client wanted to be trust worthy, professional, and respected. The logo was designed in Adobe Illustrator and the Style Board was created using Adobe InDesign.